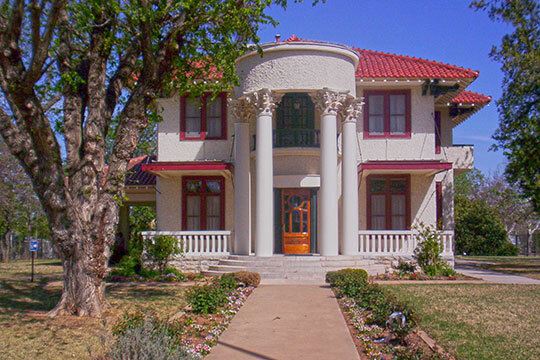 Lawton City Hall is located at 212 SW 9th Street, Lawton, OK 73501; phone: 580-581-3500. Photo: Mattie Beal House, ca. 1910, 1008 SW 5th St, Lawton, OK. Listed on the National Register of Historic Places in 1975. Photographed by user:Crimsonedge34 (own work), 2011, [cc-by-3.0 (creativecommons.org/licenses/by/3.0)], via Wikimedia Commons, accessed February, 2015. The history of the city of Lawton begins before the 1901 opening of the Kiowa-Comanche-Apache unassigned lands. Beginning in 1892, the United States government began negotiating an agreement with the Kiowa, Comanche, Apache and Wichita tribes regarding the sale of their surplus lands equaling approximately 3.6 million acres. Although Congress approved the Wichita agreement in 1895, action was suspended until sanction of the Kiowa, Comanche and Apache agreement, which ultimately occurred in 1900. At this time, the former reservation lands were divided into three counties, Caddo, Comanche and Kiowa. In each of these counties a half section of land was reserved for the development of a county seat. In Comanche County, the federal government created the town of Lawton as the county seat. The town was to be located just south of Fort Sill, a military outpost since 1869. With the impending opening of unassigned lands in Oklahoma Territory, land fever drew thousands of speculators to the edge of the shortgrass prairies. The chaos of the earlier land runs forced the federal government to reorganize its method of dispersal of Indian lands with a land lottery. It created government-planned county seats of 320 acres with sites set aside for courthouses, residential areas, central business districts, and schools. To keep order, the U.S. Army presided over the registration at the land offices in Fort Sill and El Reno. During July, 1901, 164,516 people registered, but only 6,500 names were drawn to lay claim to 160 acres of agricultural land. On August 6, 1901, many claims were filed and over 1200 town lots were auctioned off to finance public buildings and works for the county seat. By the morning of August 7, the burgeoning town of Lawton was firmly established with tents in place of the buildings soon to come. Lawton's future as a strong economic center was secured with the established military facility, Fort Sill, and with the early arrival of the railroad. Anticipating the opening, tracks for the Rock Island and Frisco Railroads were all but completed just prior to the opening of the lands. By 1902, the Oklahoma City and Western Railroad lines connected Lawton and Oklahoma City. The early presence of a railroad provided three important assets to the community. First, it created a major transportation artery into a remote area. Prior to that time, the only roadways were stage routes, military trails, and ruts from the cattle drives. Second, it transported important building materials, which included brick, to be on site for immediate construction of the central business district. Third, it established Lawton as a major agri-rail center by providing a mode for the exportation of local commodities. The town's population swelled to an estimated eight thousand people within the first year of its founding. The city's limits expanded from the original townsite with successive additions. After the flurries of the land opening settled, civic leaders concentrated on the problems of the development of its infrastructure and culture, including providing education facilities. Neysa Clark, Historical Geographer and Jill Marsh, Oklahoma State Historic Preservation Office, Lawton High School, Comanche County Oklahoma, nomination document, 1996, National Park Service, National Register of Historic Places, Washington, D.C.